Yuhu, finally a new wallpaper from me. 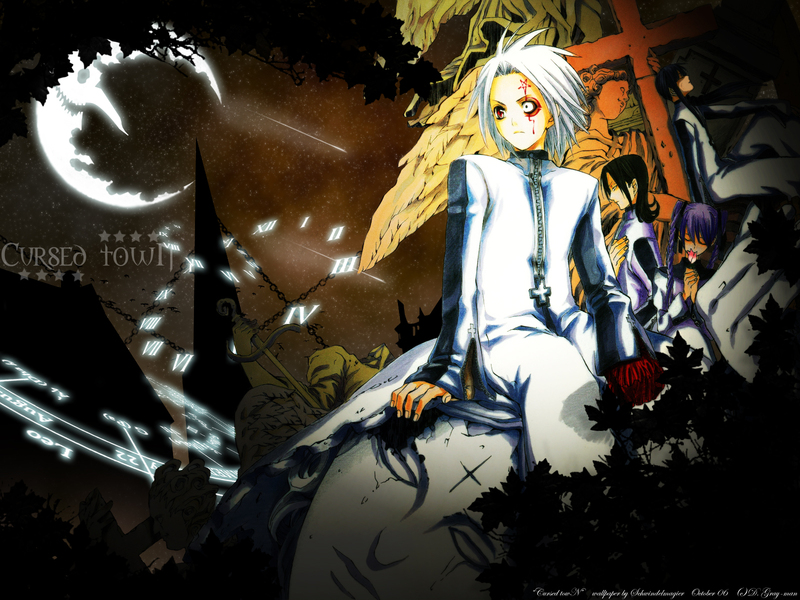 This time: D. Gray-man. Aaaah~~~ I love D. Gray-man...I love Allen Walker (but not as much as Fai :D). After trying to overcome my creativeless situation (well, this wallie doesn't ooze of brand-new ideas but I like it though ^_^') and try to find a beautiful scan for my new wallie....this is the result...tadaa. At the beginning, the bg should look totally different than it turned out in the end. I have no idea why my wallies often turn out different than I thought...well, but it is good this way ^_^. I love the dawn-sky, so beautiful *_* especially my self-made moon (a little bit creepy). The title "Cursed towN" is an allusion to Allen's state...poor guy. Because his left eye is cursed, he sees his world in a different way...more like the hell. It is helpful but no blessing though. The stars that decorate the title are also an allusion to "cursed". Those who know D. Gray-man will know what I mean. I hope that everyone notices the magic circles and the chains that surround the town. ^_^' The tree in front of the scan is selfmade; many, many leaves to add O.o. ooooooh! d gray-man! i love it! Oooooh, awesome. I like how those magical circle thingys are surrounding the houses, and the spooky atmosphere as well! Fave from me ^_~. Beautiful wallpaper! It looks really cool! The background is excellent and the shadows arround give a touch of misterious... and like said BlueAngel17, the effects of time are so cool. nice wallpaper, the scene is good, i like all the things you put in the bg. -the twigs overlapping the moon at the top are very pixellated. other than those 2, i think this wall is really good! Sky color is quite interesting, and Im liking those chains and time dials around the buildings. Kisses and tons of hugs! Waaaaaaaaaaaaaaaaaaah Enchant's sooooooo stoopid that she forgot to comment Magier-chan's wall which was a looooooong time ago ^_^' I just found it buried in the depths of my notifs @. @ Anyways, another lovely D-GrayMan wall! :D Eh? Allen Walker? I thought you love Tiki? XD The numbers you did and the patterns you arranged them are brilliant! I dunno why but I've always loved Roman numbers ^^ Nyaaaaa the moon, I love the moon XD Creepy but in a cute way! Keep it up! Love your moon and the sky and and! everything! By animation and comics, there is different charm each. nice wallpaper, like the background very much.. Awesome wallpaper, thanks for sharing. i like the background part..! Allen is so awesome I want his eye and arm! Allen looks really cool here! Blowing by the wind!